Thread: Lube for big KMC SS chains? I've got a pretty big chain on my SS. It's a KMC that I think is made for BMX or something like that. It's relatively new. I use White Lightning dry lube on my Shimano 2x10 Yeti and it works great. In dry conditions, I can go several rides between applications with no trouble. However, my SS needs a re-lube every ride because I can hear the chain after more than 2 hours. It's not a squeak or a squeal but more of a low grind. Re-lubing it silences the chain for a while but after an hour or so, back to the grinding sound. I'm thinking maybe the links have so much play in them (it's a really thick chain!) that the lube isn't staying on the plates well. Is there a better lube to use on these chains? Sounds like your chain line is off. Lube will help silence this, but only so much and for so long. I use squirt lube. It's awesome. I'm currently using a KMC 610HX SS 3/32" series chain on mine with the White Lightning chain lube, usually go for several rides before lubing. Is your whole drivetrain 1/8 or 3/32? 1/8 chain on 3/32 rings can be noisy. I have run a 1/8 chain for a long time. I have not had an issue with noise. The condition where I ride the most has a very fine dust, like silt. When I use white lightning, I have no issues. If I put a wet lube (like Triflo) on the chain after it is worn (a couple hundred miles), I will get a lot of chain stretch as the slit/dust is flushed out of the bushings. I don't have this issue with my geared bike running a 10sp chain. For the noise, check chain line (take some measurements, I am always way off when I try to eyeball it). If it's straight, see what rings/cogs you are using and try a 3/32 chain. low grind "sounds" to me like a new chain bedding into older gears. if that is it it will go away as everything melds together. I think you have that backwards. 3/32 chain on 1/8 rings would be a problem. But a 1/8 chain on 3/32 rings would mean the chain has more room between the plates than what the teeth on the rings take up. This alone wouldn't cause any untoward noise. Agreed the 3/32 on 1/8 rings would be a real problem, but the one time I used a 1/8 chain I had lying around on 3/32 rings I could hear it, maybe a dry lube thing, YMMV. But that reminds me, my last 2 Surly chainrings seemed to be not up to standards, one was a hair too wide in places which caused noise unless freshly lubed as some of the teeth would get gripped by the chain. The other had crap machine marks in the valleys between teeth also caused some odd noises. +1 on Squirt lube! The key is to start with a clean chain, then give it 2 applications. After the ride, use a brush to brake off debris and then run it though a rag lightly. Do not over-lube. Only re-lube once you hear the chain to start to squeak. For me, that is every 5 or 6 rides. I've found White Lightning to be notoriously short lived under most circumstances. Agreed. White a Lightning doesn't last. I have had it start squeaking half way through a ride. Rock and Roll or Dumonde for me. I have been using 3-IN-ONE Multi-Purpose Oil for over 20 years, cheap and works. Agreed. But in dusty condition it tends to get gummy in the cogs. But I do like it for wet conditions. Agreed, too. But quick rug-off after the ride, and you are good to go again! 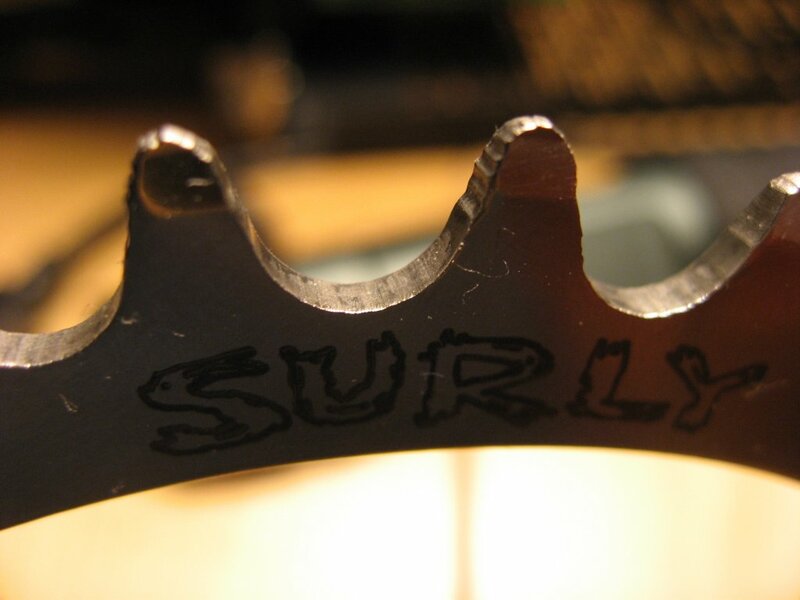 Here's the Surly ring with bad machining, only had it on a few days made some nasty noises. For wet conditions I use chain saw oil ('cos I always have plenty). For the few days a year that we have dry conditions I use any dry lube I have handy. Those aren't even the worst examples, just used those cuz they were near the logo. By the way, the worst "lube" (in my opinion) is WD-40. It's a mess! I don't even think it is actually lube, but a solvent. Also, WD-40 makes a dry lube that has a really foul smell to it (like a mix of Old Spice and Brill cream from the 60's). This, had the exact same thing with a new KMC SS chain. Took a week or two of daily commuting to get rid of the sound. Lubing helped but only for a ride or two. I've only used home brew. 1/2 gas, 1/2 30 weight oil, or chainsaw bar oil . Some guys sub gas with mineral spirits. Use on all my bikes. There are a tremendous number of home brew users out there. I found a number of threads on MTBR. My 1/8 chain runs silent and trouble free with Eno freewheel, and on one stainless chainring. Though the chain line is very good. Chains: How often do you change out chains? What is recommended? Chain lube question -- lube internals only? Clean and Lube chain or just lube after riding in the rain?